Philosophy– Our New Cumberland pre kindergarten program has been established to provide quality experiences for children four and five years of age. Our goal is to promote the emotional, social, intellectual, communicative and physical development of the child. Our aim is to provide a safe and fun atmosphere to prepare our children for Kindergarten. We dedicate ourselves to nurture a positive self-image and a love of learning. Accredited Program: Our Pre K program in New Cumberland is held to the rigorous standards of the Pennsylvania Department of Education and the Pennsylvania Keystone Stars program. Our program is lead by teachers who have Bachelors degrees in Early Childhood Education and teaching certificates from the Pennsylvania Department of Education. Curriculum- At Learning and Sharing, our curriculum is based on the PA State Early Learning Standards and coincides with the standards that are required by the public school system. Our lessons are based on weekly themes that reflect the interests of our children, changing seasons, holidays and much more! Circle Time – Every morning the class comes together in a structured and fun way. It is social interaction, music and discussion. Every morning the group participates in calendar, weather, helper jobs and theme related activities. Circle time allows the children to learn to take turns, extend their listening skills and work cooperatively. Basic Skills – These are taught through the curriculum Subject areas include Language Arts, Math and Social Sciences. Examples of Language Arts concepts include whole language activities that involve listening to and retelling stories, alphabet recognition, name recognition and answering questions. A weekly “writing experience” is completed as we introduce the KidWriting program that they will use in Kindergarten. Examples of Social Science concepts are learning about the world around them (careers, wildlife, transportation, etc.). This area also includes learning about the child’s self, their similarities and differences with their classmates and family life. Teachers work with the children to introduce these concepts and reinforce them as needed. Example of Math concepts include counting, one-to-one correspondence, shape and color recognition, more or less, size discrimination and matching. Special Interest Activities – These activities are organized to create a fun and exciting way to learn about our weekly themes. Activities include a weekly cooking project, science experiments, Show & Share and discussion and exploration of our themes. Charting and graphing are often used to show the outcome of discussion on different subject areas. Arts & Crafts – Craft items are available daily for use during centers. Teacher guided activities are designed to engage the children to use a variety of materials, use their fine motor skills and imaginations. Activities that are included during this time are group painting, coloring, cutting, gluing and drawing. Every child’s work is often displayed throughout the room in an effort to build the self-esteem of the child. Music & Movement – Participation in daily music activities develops creative expression and helps with coordination of large and small muscle groups. Movement and dancing is a fun way to learn skills like color recognition, body part familiarity and following directions. 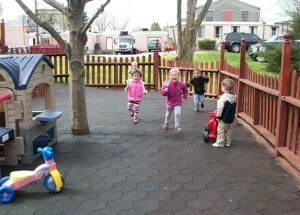 Outdoor movement includes use of the preschool playground as well as the sports field. Skills such as throwing, catching, kicking, running, hopping and skipping are practiced. The class also takes frequent walks through the Borough Park (located adjacent to our center).